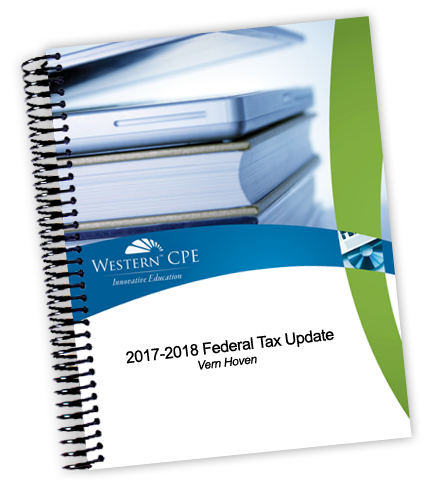 Get the most comprehensive, informative federal tax update in the industry with Western CPE’s Federal Tax Update. Led by renowned tax experts, our tax update seminars, live webcasts, on-demand video, and self-study CPE options provide you with the insight and information you need, in formats that meet the demands of your already-full schedule. Included with your course are a high-tech, comprehensive tax manual, hyperlinked to the Internal Revenue Code. It will be your go-to resource for the entire tax season. Get the most comprehensive, informative FEDERAL TAX UPDATE in the industry. Led by renowned tax expert, Vern Hoven, Western CPE’s tax update seminars, live webcasts, and self-study CPE options provide you with the insight and information you need in formats that meet the demands of your already-full schedule. UP TO 28 HOURS OF CONTENT! Experience the industry’s most comprehensive, full-integrated FEDERAL & CALIFORNIA TAX UPDATE. Led by renowned tax experts, Sharon Kreider and Karen Brosi, our seminars, live webcasts and self-study CPE options provide the information you need with flexibility and value that will maximize your time and money. UP TO 30 HOURS OF CONTENT! Great content that was well presented. Excellent take-home materials. Very worth the money and time. Receive a fully-linked, dynamic, PDF copy of our 2018-2019 Federal or Federal & California Tax Update Manual, when you purchase any Tax Update course. This easy-to-use resource will support your success, not just in the course, but throughout the tax season.